Although the ravages of the Ebola virus are no secret, the structure of some of the virus’ most minute components have remained a mystery. EMBL’s John Briggs explains the key finding of a recent paper published in Nature that reveals the make-up of a critical part of the Ebola virus, called the nucleocapsid. 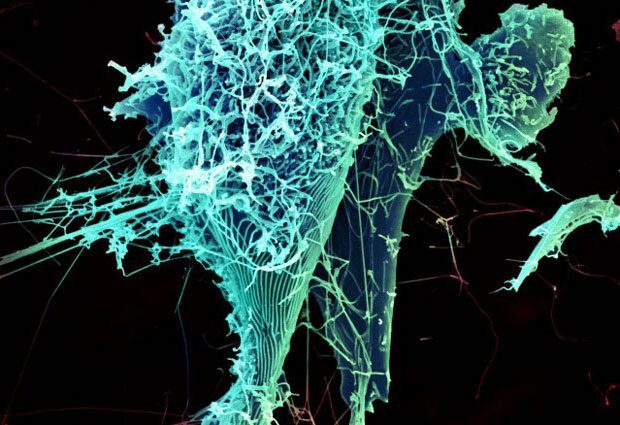 EMBL researchers have collaborated with researchers from the University of Marburg in Germany and the Institute for Frontier Life and Medical Sciences in Japan to create a 3D model of the Ebola virus’ nucleocapsid. By creating a model of this structure that surpasses the resolution of existing models, the team hopes to have provided the scientific community with a catalyst for answering important questions about how the Ebola virus replicates and infects new host cells. We created a 3D model of a crucial part of the Ebola virus called the nucleocapsid. The Ebola virus is like a long tube. Inside that tube is the nucleocapsid: the genetic material of the virus (RNA) wound up with a large number of proteins into a structure that looks sort of like a spring. The nucleocapsid is important because it packages the RNA in order to make a new virus. In addition, when the virus fuses with a new cell and releases its RNA into the host, the protein helps protect the genetic material against the cell’s defence mechanisms. Proteins in the nucleocapsid are needed for the process of copying the RNA, too. Using cryo-electron tomography, we calculated a 3D model which allows us to see how the proteins that compose the nucleocapsid are folded up and how the different components are connected – how the proteins are bound to the RNA and to one another. Our team’s 3D models provide a starting point for understanding the structure of the virus. Although other groups, including ourselves, have modeled the Ebola nucleocapsid before, we have now done our imaging at a much higher level of detail, and have done it within the virus itself. This level of detail wasn’t available for Ebola or any other related viruses with this same kind of spring-shaped nucleocapsid. Since this is basic science, it’s tricky to pinpoint one particular way this will prove to be important later on. But if a future researcher is trying to understand how the Ebola virus works and has a 3D model of the nucleocapsid that she can rotate on a computer, even if the model doesn’t directly answer the question she’s been thinking about right then, hopefully our model could—consciously or unconsciously—help inform the questions she may ask in the future. 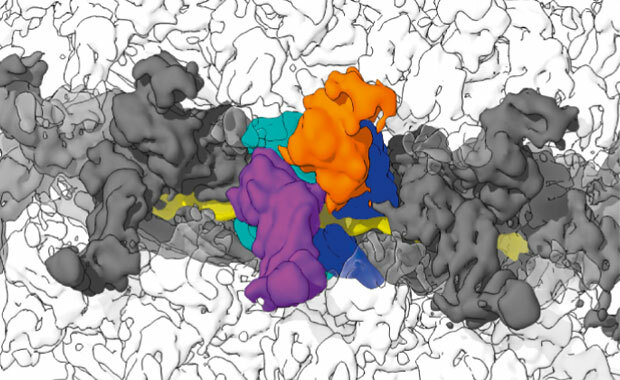 Combined cryo-electron tomography and subtomogram averaging enables scientists to study structures inside irregular viruses like HIV, or within cells. In essence, the scientists use an electron microscope to obtain a 3D image of the sample. They then identify all the copies of the object they want to study and use software to rotate the 3D image of each copy so that they are all facing the same way. By repeating this procedure with thousands of images, the scientists can obtain an accurate picture. With this approach, researchers can study such samples without having to purify them in a test-tube, which means that they see them in their real state.